How good a detective was Sherlock Holmes? · How many criminals escape? · How many victims are shot? How many are poisoned? · How many crimes do Holmes & Watson commit? NO, these are NOT the statistics you despaired over in school! This IS another way to look at the Canon you know and enjoy. · Holmes & Watson commit 50 crimes. Find out what they are and why they’re done. · There are 34 killers in the 56 short stories. 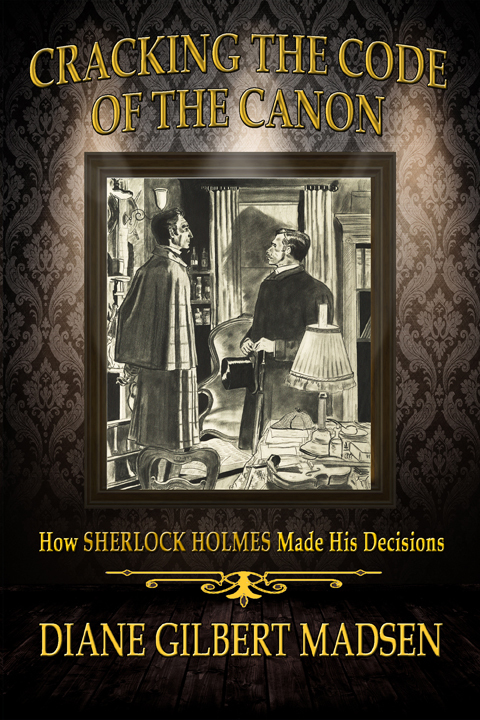 Diane Gilbert Madsen’s new book, Cracking the Code of the Canon, breaks the Canon wide open to offer a totally unique and different way of looking at Holmes and Watson and all the stories in the Canon you know and enjoy. It was written by lifelong Sherlockian and award-winning mystery author Diane Gilbert Madsen (The Conan Doyle Notes: The Secret of Jack the Ripper; Hunting for Hemingway; and A Cadger’s Curse.). She brings her amusing style to a remarkable overview of the Canon that will intrigue Sherlockian novices and aficionados alike. Her readable and entertaining take on the Sherlock Holmes approach to crime, criminals, victims and justice may alter many of your views of the Canon. Statistics can be fun when they relate to Sherlockian lore.